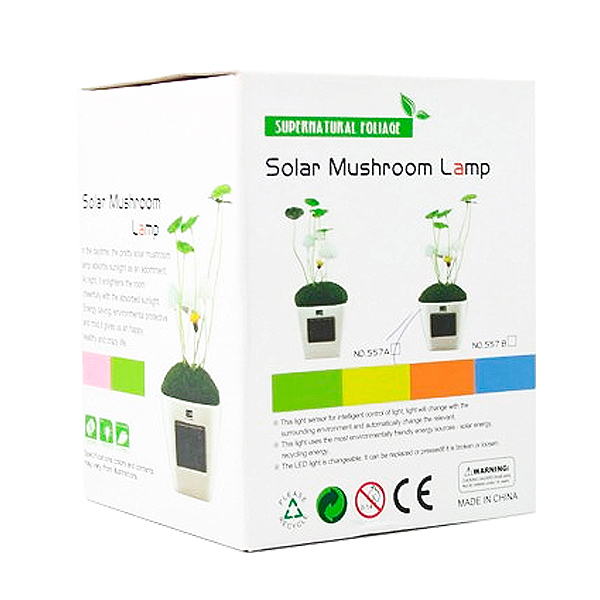 Solar Mushroom LED Lamp is like a mini mushroom farm. The three big shrooms look to be sprouting out of a tuft of neatly-manicured grass, and they light up and change colors for a spectacular light show. 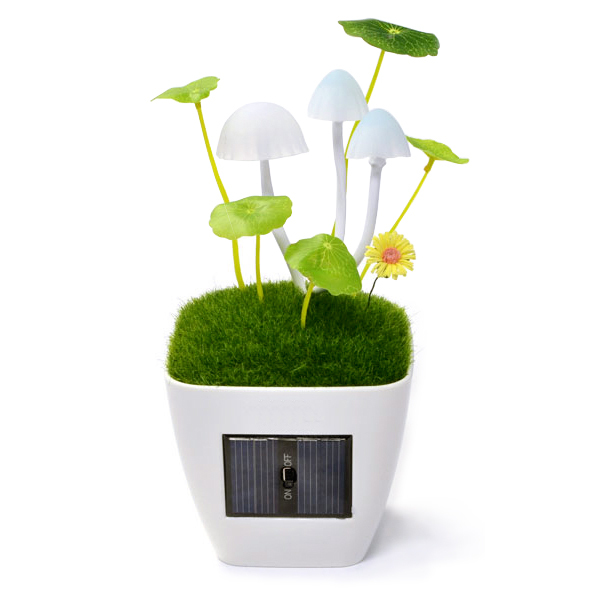 In the daytime, the pretty solar mushroom lamp absorbs sunlight as an adornment. At night, it enlightens the room cheerfully with the absorbed sunlight. There are stemmed lilypad-shaped leaves and a cute, yellow/orange daisy-like flower that come with the lamp, so you can let your inner flower arranger loose and rearrange them every day. Energy saving, environment protective and mild, it gives us an happy and crazy day. Made with Ceramic & Recycled plastic. Solar power is completely environmental friendly. It does not produce any byproducts such as carbon dioxide, that is basically blamed for greenhouse gases (GHG) and global warming. It does not produce any known pollutants that is released to the environment. Solar energy is a sustainable source of energy that producers no greenhouse gas emissions. These energy source are also know as renewable sources as their supply is limitless and practically free. Solar powered, no external power needed (4 hours of sunshine can be filled with electricity, then full use for 8 hours). Ceramic pot, green grass design, mushrooms on the grass. Plant and flower plug by yourself. Do not drop or overcharge. Do not use it in extreme cold or heat temperatures and avoid very dusty or humid environment, it will diminish the battery life. Do not use erodent liquid to clean the product, only clean it with neutral cleaning liquid with soft cloth. To avoid battery discharge or damage, completely turn off when storing or not in use. Do not immerse the product into water or any liquids. • How Green Are We? • Want to talk to us? © 2019 Green Pal Store Copyright, All Rights Reserved.